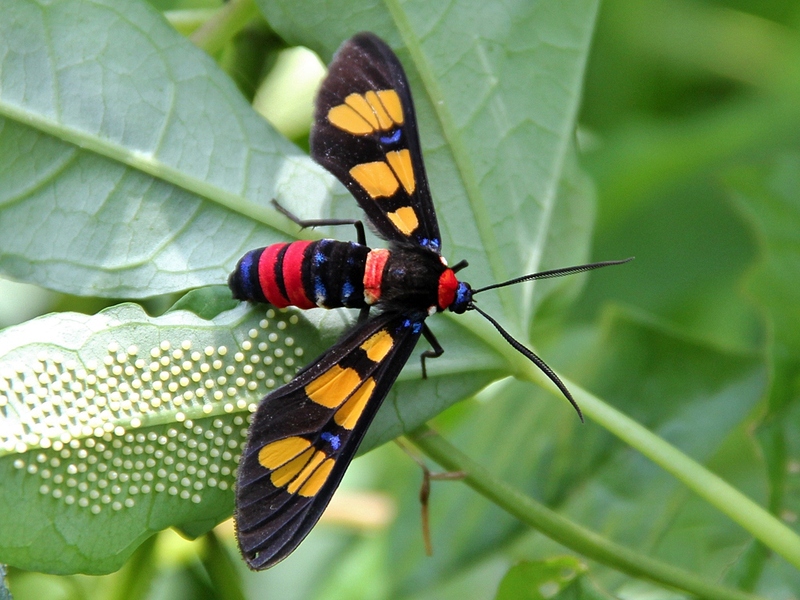 Clearwing tiger moths, also called Wasp moths (Syntomini, Arctiinae, Erebidae), are somewhat similar in appearance to clear-wing moths in the family Sesiidae, but many do not have transparent wings. Those that do have transparent wings, like the one shown here (above and below) which I photographed in northern Thailand, are presumably, wasp mimics. 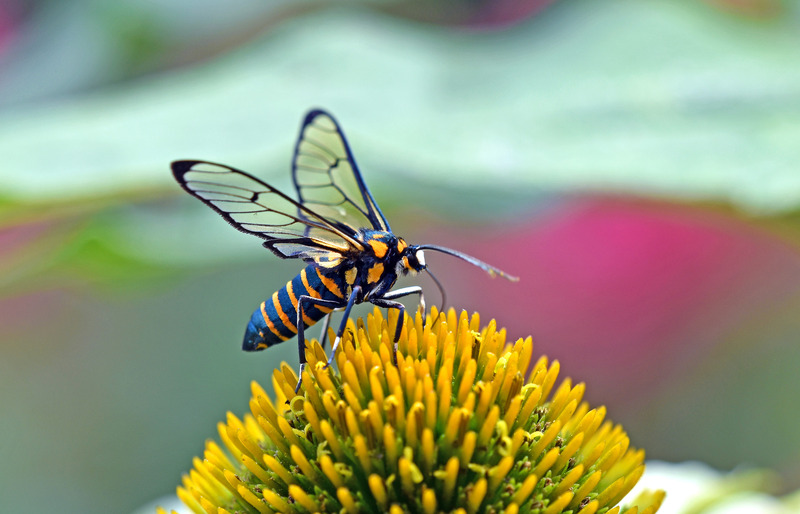 Here is another clearwing tiger moth from China, which appears to be mimicking a wasp? Note the same white patch on forehead! This is probably Ceryx sphenodes, also shown here. 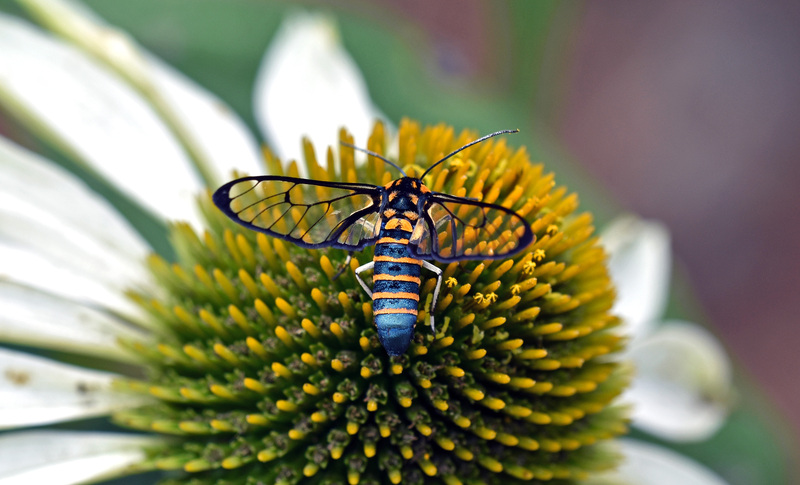 So these clearwing tiger moths appear to be Batesian mimics, befitting from the advantages of looking like a wasp; but that does not mean that they might not also be toxic themselves! 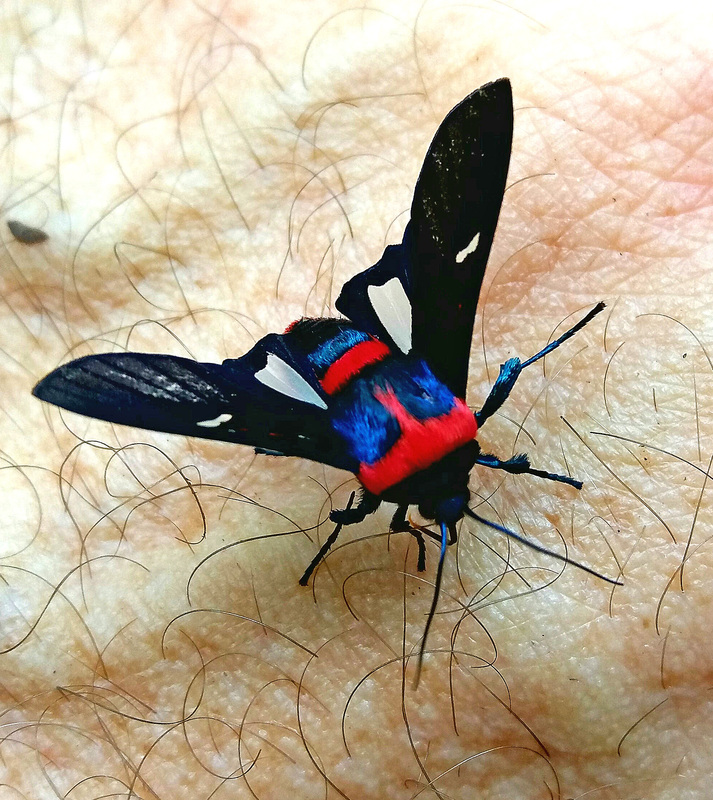 The bright metallic blue and yellow-orange colours of this tiger moth, which is probably a species in the genus Amata, also function as aposematic (warning) colouration. So although these tiger moths are very attractive to our eyes, they probably appear as something quite startling startling, and to be avoided, by birds and other would be predators. Even those which have not yet come across a wasp! Many of the Amata species are beautifully coloured, with shiny blue, red, yellow and black colours, similar to that of Euchromia polymena (below). Instead of transparent windows in the wings, this species has yellow wing patches which might function in a similar way when viewed from a distance? It is hard to imagine that these brightly coloured tiger moths like E. polymena (above) have actually evolved to mimic any particular species of wasp. Rather, they seem to be displaying a super-stimulating array of aposematic colours. It is known that some erebid tiger moths, including other Amata species, are known to associate with Zygaenid moths in Müllerian mimicry relationships, where both types of moth are toxic or distasteful. Indeed, many tiger moths in the tribe Syntomini (family: Erebidae) looke very similar to each other, as shown here in this collection of specimens from the Philippines. Their similar appearance helps to reinforce the message that they are poisonous! Or at least not very nice to try to eat! 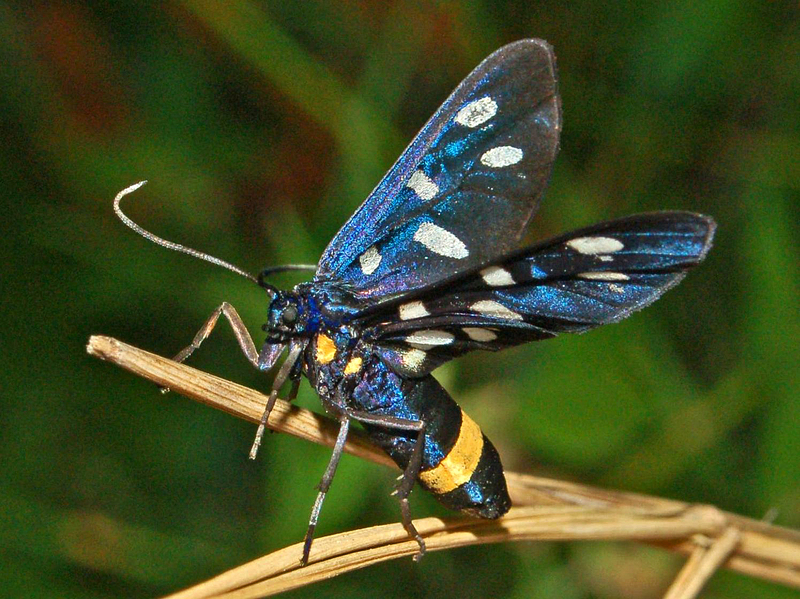 Amata phegea, the nine-spotted moth or yellow belted burnet (below), is an example of a tiger moth species which is repellent to many avian predators. It is similar to a form of Zygaena ephialtes which is also distasteful as they contain cyanogenic glucosides, which release toxic hydrogen cyanide upon degradation. So there is a lot going on here with these moths. Some species in completely different families (Sesiidae, Arctiidae, Zygaenidae) mimic bees and wasps, but are also unpalatable and probably part of many different mimicry complexes. The details of many (most) of these mimicry rings are largely unstudied and unknown and there is a vast amount of work that could be done to investigate the exact nature of the relationships. The type of mimicry – Batesian (I’m harmless but I look poisonous/dangerous); Müllerian (we are all pretty nasty!) – is not either/or, but these types of relationships probably represent two ends of a spectrum of possibilities (see Quicke, 2017). N.B. Amata is a large genus of tiger moths in the Erebidae family; there are many similar species and I am not sure of the specific identity of this species which I photographed at Doi Ang Khang in northern Thailand on 15 April 2018. Amata sp. Doi Ang Khang, northern Thailand. Many Amata species are beautifully coloured, with shiny blue, red, yellow and black colours. There are however, other similarly brightly coloured day-flying moths – called window-winged Moths (Family Thyrididae) – which also have strong (e.g. black and red) warning colours and coloured wing patches. I had the pleasure of observing one of these at close quarters, when it landed on my hand to partake of some sweat! I somehow managed to take these photographs with my mobile phone! Quicke, D. L. (2017). Mimicry, Crypsis, Masquerade and Other Adaptive Resemblances. John Wiley & Sons. Rothschild, M., Von Euw, J., & Reichstein, T. (1973). Cardiac glycosides (heart poisons) in the polka-dot moth Syntomeida epilais Walk. (Ctenuchidae: Lep.) with some observations on the toxic qualities of Amata (= Syntomis) phegea (L.). Proc. R. Soc. Lond. B, 183(1072), 227-247. Rothschild, M., Moore, B. P., & Brown, W. V. (1984). 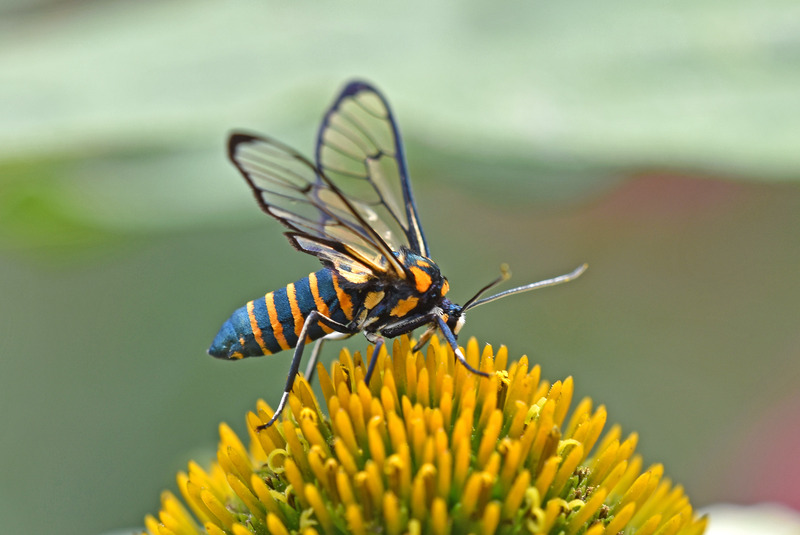 Pyrazines as warning odour components in the monarch butterfly, Danaus plexippus, and in moths of the genera Zygaena and Amata (Lepidoptera). Biological Journal of the Linnean Society, 23(4), 375-380. Sbordoni, V., Bullini, L., Scarpelli, G., Forestiero, S., & Rampini, M. (1979). Mimicry in the burnet moth Zygaena ephialtes: population studies and evidence of a Batesian—Müllerian situation. Ecological Entomology, 4(1), 83-93. Next Next post: Fighting over a dead frog! 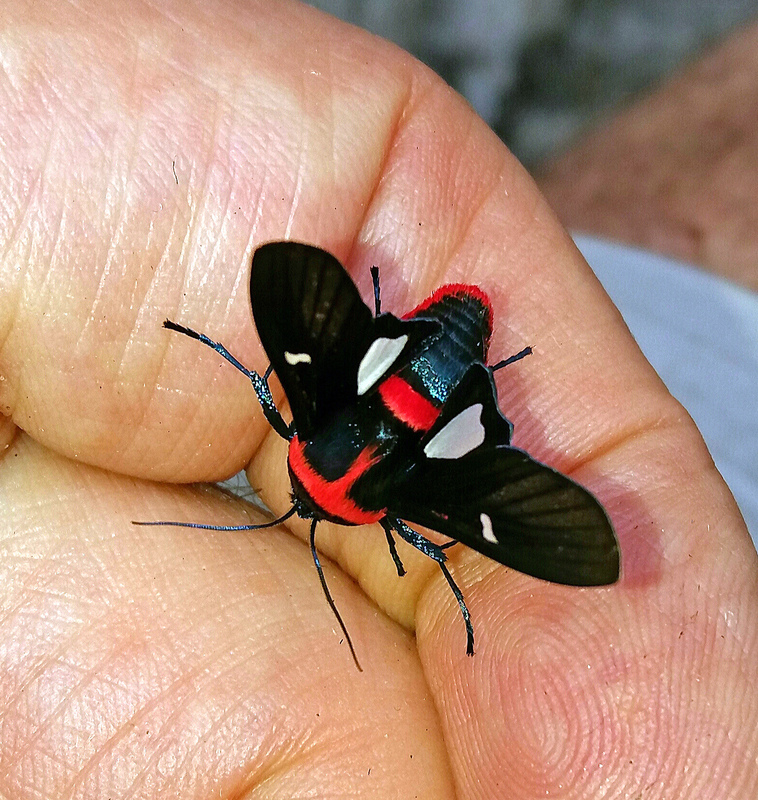 Beautiful insects Ray, very informative post as usual. Wow! Thanks for all the interesting information. You are most welcome, thanks for reading!